Last night, House Republicans released their so-called replacement bill, the American Health Care Act, which would repeal broad parts of the Affordable Care Act (ACA) and make radical and harmful changes to Medicaid that would result in millions of people losing their health care. It’s no wonder the bill’s drafters kept the content a secret as long as possible. There is more information below on what the Republican bill does, but we need you to act now. 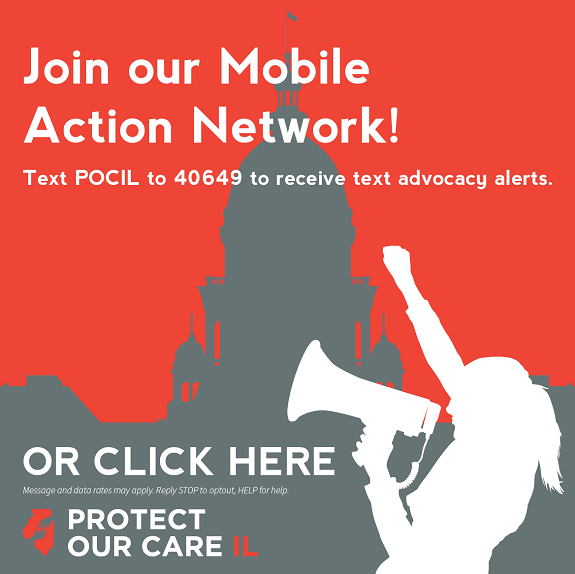 Call your Representative NOW, 202-224-3121 and demand that they stand strong in support of the ACA and do not vote to strip health care from millions. Call the Capitol switchboard, 202-224-3121, and enter your ZIP code to find out who your Representative is. Click here to find out who your Representative is ahead of time. Hello, my name is _____ and I am a resident of Illinois. I am calling to demand that Representative ____ vote against repealing the ACA and cutting Medicaid funding. The American Health Care Act is not an adequate replacement that protects my care! There are three Illinois Republican House Members on the two committees debating the bill this week. They need to hear from you, too! Benefit the wealthy and healthy at the expense of those who are low-income and sick. Make coverage less accessible and less affordable – including a 30% “sick tax” on people who have a break in coverage. Increase out-of-pocket costs while eliminating many of the ACA’s benefits and consumer protections. Make deep cuts to Medicaid and cap federal funding for the program – which will result in reduced access to coverage and benefits for seniors, people with disabilities and children and shift costs to states. We deserve careful consideration of any changes to health insurance that will impact family’s lives, financial security, and access to health care. More importantly, we deserve the right to understand the proposed changes so that we can ask questions and share our concerns with those elected to represent us.